The Barbican, Plymouth’s harbour area was an old trading port and is home to Britain’s maritime heritage. It was from Plymouth that many of the early pioneering voyages set sail. Sir Francis Drake, Sir John Hawkins, Sir Walter Raleigh and Captain Cook, all sailed from Plymouth, as did Charles Darwin many years later in the Beagle. The Barbican is also famous as the starting point for the historic voyages made by the Pilgrim Fathers who left from the Barbican for the new world of America. Whilst the actual steps no longer exist, the present Mayflower Steps marks the area from which the Mayflower sailed on its historic voyage in 1620. Around the Mayflower Steps are several plaques and tablets commemorating various historical events at the Barbican. At the Plymouth Mayflower is an extensive exhibition that tells of the lives of the merchant families, Plymouth’s fishing industry, the naval harbour and the epic voyage by the Pilgrim Fathers in the Mayflower and others after them. Today the Barbican is a thriving tourist destination with a large choice of restaurants, bars and al fresco dining. The sail ships have been replaced by pleasure yachts, dive boats and fishing boats. Although the Old Fish Market has been relocated to the other side of the harbour, the Barbican is still home to many fishermen. Relax in the enchanting Elizabethan Gardens or take a guided tour of the fortified Royal Citadel (between May and September). This fortification was built by Charles II in 1666 to both defend and intimidate the citizens. It is still home to front-line British troops. For those with a predilection for gin, a visit to the Black Friars Distillery will be happy experience. For indoor entertainment, the Plymouth Arts Centre , Barbican Theatre, Barbican Leisure Park and the National Marine Aquarium are within easy stroll of each other. Sailing excursions, pleasure boat trips of Plymouth Harbour and diving expeditions are popular things to do in Plymouth. You can go fishing, windsurfing or take a water taxi and walk along the South West Coast Path at Mount Batten and Jennycliff or head west and take the Cawsand ferry to this pretty Cornish village. For the shoppers with money to burn, the Barbican’s winding lanes are packed with a range of antique shops and galleries displaying the works of famous local artists. 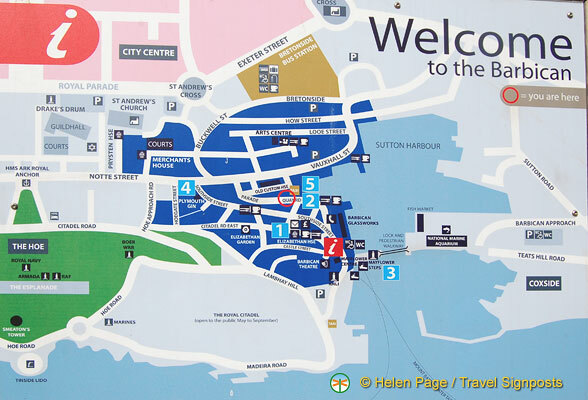 If you need information on what’s on in Plymouth, or other travel information, the Plymouth Tourist Information Centre is housed in the Plymouth Mayflower at 3-5 The Barbican (see the Plymouth Barbican map). Search for Plymouth hotels, read hotel reviews and book your Plymouth hotel HERE. See more Barbican photos at Travelsignposts Plymouth photo galleries HERE.